In celebration of International Museum Day on 18th May 2013, the Cape Town Diamond Museum invites you to bring along your friends and family to experience, explore, discover and learn about the wonderful world of diamonds with complimentary entrance to the museum on Saturday 18th and Sunday 19th May. 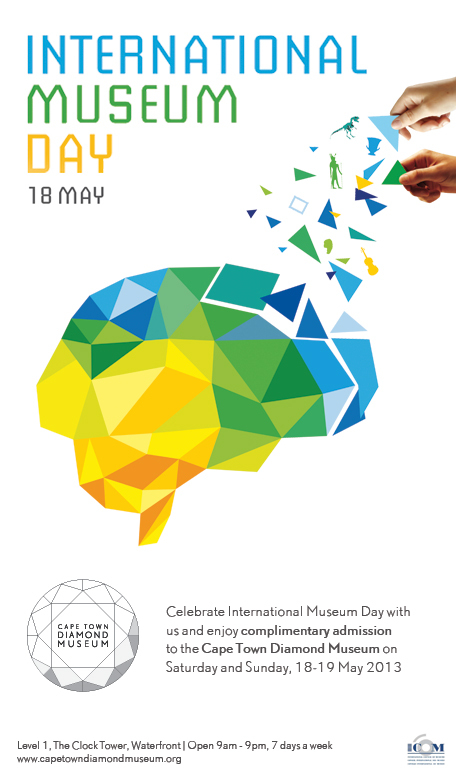 This year, the theme of the International Museum Day will be: Museums (memory + creativity) = social change. Established in 1977 by the International Council of Museum, the day aims to raise awareness on how museums are integral to the development of society, and a day where international recognition is given to museums for their contribution to our world’s culture. On your personal tour through the Diamond Museum, you can look forward to experiencing first-hand South Africa’s significant contribution to the international diamond industry. Explore the history of the South African diamond rush and see life-size replicas of the world’s most famous diamonds. You can even walk through a replica mine shaft, complete with realistic sound and lighting. For bookings please call 021 421 2488.